The notion that going to a “good” college is a ticket to a brighter future should be taken on a case by case basis, but this isn’t what American society would have you believe. I want you to think about this example, which is all too common: an extremely high academically performing high school senior goes to talk to a guidance counselor, who promptly trumpets that the Ivy League is the only place for her. Her history suggests nothing less than extraordinary achievement; will not going to an Ivy League school change this trend? The question is not if she will fail by not going to an Ivy League, but whether her trend of success will come to an end. Probably not, but if she listens to the counselor (who is flattering her, so it’s probable she will want to eat what she is being fed) she will come to believe meeting her potential hinges on attending an Ivy League. The disservice here is that the high school counselor based her opinions on two forms of selection bias: non-marginal comparisons and conclusions drawn from data that is unrelated. Marginal comparisons allow us to compare things apples to apples, not apples to steak tips. In the case of our talented student, the counselor failed to make a marginal comparison because she framed the Ivy League question in an all or nothing manner. That is, in framing her opinion to our student she compared getting an Ivy League education to getting no higher education at all. What would our student do if she chose not to attend an Ivy League? In the counselors world she would be hooking on the street, but in reality she would probably attend a non-Ivy league college. So by not comparing an Ivy League education to that of a non-Ivy League education, the counselor failed to make a marginal comparison. This is probably the largest error people make throughout the college process, and not just in regards to the Ivy League. When I was applying to college I was convinced that if I didn’t attend a brand-name school I would end up sharing a van down by the river with Matt Foley. Selection bias, for those unacquainted with statistics, is an inherent error or lack of focus in the data used for a statistical analysis, thus calling into question the conclusions drawn from the analysis. Selection bias is common because it’s in many cases hard to avoid completely. This in and of itself is not the problem, it’s more of a fact of statistics; it’s when faulty conclusions start being championed as absolute fact that selection bias becomes a real issue. Acceptance Rate: This tells you the percent of students accepted out of the application pool. The bias within this is that this measure doesn’t really tell you anything about the quality of education at this institution, but rather shows more about how popular the school is in the application process. One might be tempted to draw the conclusion that this shows how competitive it is to be accepted into a school, but this too is a stretch. I could get every crack addict in New York to apply to Quincy College, they would all be rejected, and suddenly Quincy College will seem a more selective institution. SAT/ACT Scores: This chunk of data tells you a lot about the abilities of its students, and not very much about the quality of education at the college. The fact that this is used in a weighted measure that ranks colleges against one another blows my mind. I guess the implication is that students who attain higher SAT/ACT scores can handle more intense classes, which is probably true, but this tells you nothing about whether there are in fact intense classes to be found, and if there are if prospective students will be able to take them. Percentage of Faculty Who are Full Time: This is a metric meant to infer how much attention a professor will pay to their students, in that the full-time professor devotes more attention to their students. This metric is as easy to manipulate as a gullible third-grader. A school can simply hire a lot of full-time professors, put them to work on managing their departments, gaining notoriety within their area of expertise through speaking engagements and paper publishing, and have grad school students teach as many classes as possible. This is why the students of the universities that rank highest in this metric still report feelings of neglect towards their professors. I could go on, but the purpose of this article is not to point out the inherent stupidity and meaningless nature of the U.S News and World Report College Rankings. I am making a larger point: since rankings such as these are the basis of much of society’s college related opinions, and the data is rife with selection bias, then the majority of the opinions we hear are as useful as Paris Hilton on trivia night. One study on college that did manage to completely eliminate selection bias from the equation was the one conducted by Alan Krueger, a Princeton economics professor. To control for the selection bias present in the varying academic abilities between students at prestigious institutions and their lesser counterparts, he looked at high performing students that were accepted into both highly exclusive schools and ones less so. Some went to the Harvard’s of the world while others attended state schools or the middle of the pack private schools. The results showed that regardless of the student’s choice, they all tended to earn about the same salary twenty years into their careers. If that doesn’t blow up the U.S News and World Report College Rankings I don’t know what does. The college admission process is stressful enough to begin with without adding to the mix meaningless, biased data and opinions. From the lack of marginal comparisons by those we trust most to guide us through the process to the application of unrelated data to conclusions society bases its opinions on, the deck can at times feel stacked against us. Not so. Tune out the cacophony of biased opinions, the “rankings”, and other drivel and focus on history: if you have a track record of success, you will likely continue to have one. With that in mind, please, ignore your high school guidance counselor. One of the most enduring images that I recall from college was a video clip of an obviously drunk student at a football game and holding up a sign which read, “I don’t care. Daddy’s paying.” At the time, although my parents had paid for my tuition, I was working about 20 hours per work to cover my costs of school attendance – roughly $15,000 per year, as compared to the approximately $8,000 per year that my parents paid for my tuition. I worked hard to pay for my car (a used car), car insurance, gasoline, food, clothing, books, entertainment – everything that I wanted or needed that was not included in the price of tuition. I also worked hard to do well in school. For four years, it was a lot of work, but I never once felt that my parents should be paying more. Indeed, I always regretted that I could not pay my own way to college, and found it much more satisfying when I did pay all of my costs in graduate school – including rent and the $15,000 per year in tuition. But back to the “Daddy’s paying” sign. Did the parents of the young woman who held up that sign really do her any favors by paying for her four year’s of binge drinking? I think not. So many people I have known have failed to invest sufficient effort in their college educations because they have not had a stake in it. You probably also know people who have felt that they could have achieved so much more in life if they had just tried harder in college – partied less, and studied more. At some point, parents need to force their kids to stand on their own two feet. Of course, the process needs to happen gradually. I have known young adults who have been required to cover all of their costs through college, others who have covered some costs, and still others who have received a free ride courtesy of the their parents. In just about every case, the people who have had a personal financial stake in their college educations have also performed far more effectively in the class room and have enjoyed much greater success upon graduating from college. I have also known parents who do not want to see their children saddled with tremendous debt upon graduating from college, so they have over-contributed to their kids college costs, without even realizing that the money intended for food and books has been spent on beer and concert tickets. The parents’ objectives were well-intended, but they failed to prepare the child-beneficiaries to face life in which we all have to work hard to pay bills – not just to play. Whether they are attending Averett University or a junior college, I do not believe that kids should feel entitled to the college education that they want. Rather, parents should make sure that a child who works hard through high school will have the opportunity to attend a good college. My wife and I prepaid the tuition in the Florida public university system 9 years ago (for a total cost of about $13,000). Our kids can attend any Florida school that they want, as long as they are accepted, and their tuition will be covered. They will have to pay all of their other costs, and they have known that for a long time. One has been saving for the past five years. The other has nothing put away (despite my urging) and may have to work for a year before he goes off to college. That is his choice. Parents can also help their kids look for scholarships and other sources of “free money” – a process that should begin when a child is a freshman in high school. In addition, parents should start their kids in an attainable savings program so that kids learn to put money away for when it is needed. Parents should not, however, feel that it is their responsibility to cover every cost that a child faces in college. Parents need to make sure that their kids have some “skin in the game” or they will run the risk of seeing their children holding up “Daddy’s paying” signs at a football game, too! What do you think? Are parents obligated to pay for their kids’ college educations? 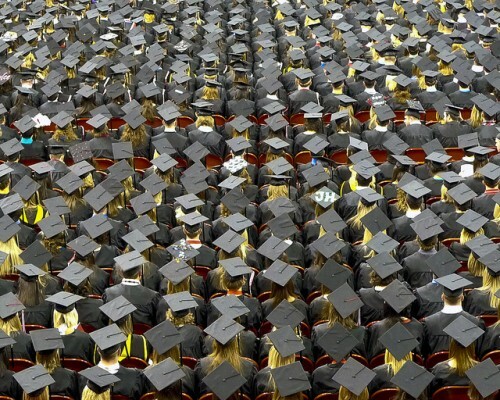 Should college students be required to pay some of their own costs? Does a parental “free ride” give students an advantage or a disadvantage? Are Children Entitled to a College Degree? It seems like every personal finance magazine I read reinforces the idea that our children are entitled to a college education. Beyond that – it’s the parent’s sole financial responsibility to provide a college education free and clear for their children. Don’t get me wrong, every parent would like their child to have a college education, but at what cost? Where was it written that we as parents need to gift a college education to our children? Those with a college degree still fair better financially than those without, but consider this: The average college graduate leaves school with $20,000 in debt. Is that really putting your child on the road to financial success? If your child is going to change the world and earn enough money to pay off that debt within 5 years, it’s probably worth it. But if your child is looking at a profession with a starting salary of $35,000, it’s going to take a long time to dig out from that degree. Any responsible parent would feel at least a little like a failure if they saddled their child with $20,000 of debt before they even joined the workforce. So it’s not surprising that many parents are paying the bill themselves. But this is putting in place an even riskier situation down the road. Parents who tap into their retirement savings, or skip saving for retirement altogether for the purpose of paying for their children’s college costs are going to end up much worse than the student with $20,000 in debt. Remember this: they have student loans for college costs, there’s no such thing as a retirement loan. With social security on the fast track to bankruptcy, and their retirement savings flushed down the university drain, the wreckage caused by a generation of retirees who spent their savings on their children’s education might make the recent credit crisis, resulting bailout and deficit increase look like a bank overdraft fee. A better choice for those in this situation is to start at a 2 year school, subsidized loans, grants, scholarships, and a part time job. I got a Bachelor’s Degree, but I did the first 2 years of classes at a community college where the tuition was a fraction of a state University. I paid for the whole thing with minimal cash from my parents, and a part time job. I got the basic classes out of the way and did it without going into debt. After that, I went to a state University for the final 2 years to focus on core classes that related to my degree. I still graduated with student loan debt, but far less than I would have had I gone straight to a 4 year school out of high school. And my various part time jobs taught me the value of money and having to work to afford the things I wanted. A win-win for me and my parents.